kt literary » Blog Archive » Buffy The Vampire Slayer’s Amber Benson narrating for Emmie Mears! Buffy The Vampire Slayer’s Amber Benson narrating for Emmie Mears! We are thrilled to announce that Amber Benson – the actress who played Tara on Buffy the Vampire Slayer – will do us the honor of narrating Emmie Mears‘s urban fantasy series for audio book! Emmie’s amazing series starts with STORM IN A TEACUP called “witty and engaging” by New York Times bestselling author Ellie Ann and “fresh-as-a-crisply-starched-shirt” by Midwest Book Review. 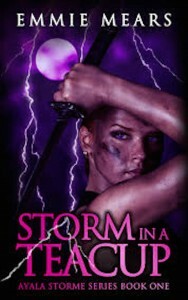 The series continues with ANY PORT IN A STORM and Book #3, TAKEN BY STORM, which hits bookshelves on December 1, 2015. All three books will be narrated by Amber and all three books will be available on December 1 via Audible. We couldn’t be more excited! Congratulations Emmie! And a huge welcome to the AYALA STORME series family to Amber! Thank you – I can’t wait to hear the amazing narration on these incredible books! ← Happy Book Birthday to HEXOMANCY!